Snaps enjoyed a period of some 40 years taking pictures of people strolling around the East coast resort of Bridlington. Here is a short history of the firm, and links to an exhibition on the images are given at the bottom of the page. Photographer William Foster Brigham, a fellow of the Royal Photography Society, opened an upmarket portrait studio on The Promenade in the town around the turn of the last century. To tap into the general tourist trade he then opened a second studio overlooking Bridlington Harbour at 18 Prince Street in 1919 (and possibly buying out an existing rival photography business carried on across the road in doing so). Snaps, as the new business was named, was a general photographic shop offering all manner of services, including ‘developing and printing’, ‘enlarging for amateurs’ and prints ready by the next day. The shop also sold cameras, film and plates. Snaps pushed Walking Pictures during the summer months, with the results displayed in glass fronted cabinets at the side of the building the next day. “Photos by Mr. Snaps Are Down These Steps” read a large hand-painted sign at the corner of the shop. People could make a note of the print number and buy in the shop. Every attempt was made to ensure the Snaps building was as eye-catching as possible, via signs above and below the windows, in huge letters painted on the end gable wall and even across the roof. A big ‘Snaps’ sign in illuminated flashing bulbs lit up the building after dusk. To complete the advertising, their catchy slogan, “Go home on a postcard”, was displayed on the side of the building. Their walking pictures all had the Snaps name printed on the back, and they used Kodak Walking Picture paper supplied in boxes of 1,000 sheets. We assume Kodak undertook to print the backs to Snaps’ requirements. All images were postcard size (see top image) until after the war, when Snaps moved to a smaller print (see image above). These carried the company name and date on the front. The quality was less good and suggests a move to smaller format cameras. Unlike some walking pictures, nearly all the Snaps subjects seem to be aware of their photograph about to be taken. As well as the walking images, Snaps photographers also took informal photographs of people sitting on benches, setting off on fishing trips, aboard pleasure boats and at local events. In the 1950s one of the Snaps cameramen had a pet monkey to attract attention and be seen in photographs, but after it bit a customer it was retired! Foster Brigham died in 1968 and the business seems to have disappeared with him, though the shop remained as Snaps for another decade or so. A film processing service still operated from the shop in the 1970s, but the work was sub-contracted. The premises were occupied by a remainder book dealer until 2010. On an off-chance I popped into the shop and asked if anyone knew about the former business. The owner was in and kindly took me on a tour of the old building, and I was astonished to find fittings from the old 1920s darkrooms still about. With his kind permission I returned some weeks later to scour the building from top to bottom and managed to salvage a few bits and pieces. The list of image details shows thumbnails of the images and gives other information. The colour photograph below shows the Snaps building from the right in 2010. The building was sold in early 2011 and has been taken over by the John Bull confectionary makers next door. Thanks Adrian, nice to share this curious photographic cul-de-sac with people. What an interesting site. 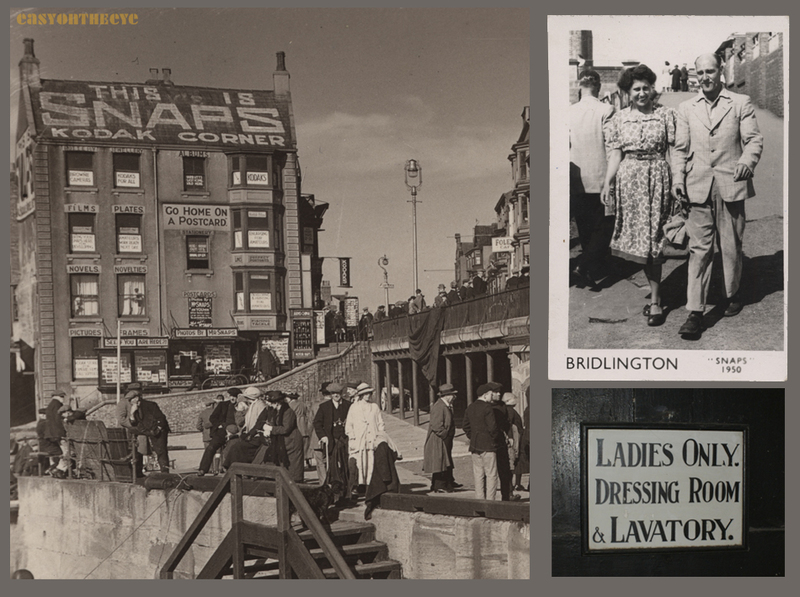 I have a photo postcard taken of my paternal great grandparents by “Snaps” of Bridlington, circa 1930 judging by the ref. number of two photo’s you have in the Gallery, V414 and V 899. The one I have is V1854, but as I don’t know how many Snaps were producing on average a week, it’s hard to be more precise. I’ve contacted Brid’ Reference Library to see if they can identify where in Brid’ it was taken. Are records still about which give info’ on the reference numbers used by Snaps? Hi Pete, If you want to send me a copy of your photo I will let you know where it was taken. Thanks for your interest. I am just wondering how to send you the pic as there doesn’t seem a facility to attach it ? The picture was actually published in the local Brid paper but didn’t evoke a great response. The windows in the buildings in the background should be the key to finding the spot, that’s if they still exist ! If I can’t suss out how to send it to you perhaps you can send me your email address? Another from Brindlington’s “Snaps” has been posted by Alan Burnett here. What a wonderful article. I’m so sad I missed the exhibition at Sewerby. I have many ‘Snaps’ photos from the 1950’s of myself and family members to look back on. In the 60’s I worked for Bensons photography in Bridlington – we were in direct competition with Snaps – and was the first photographer in Brid to take photo slides for keyring viewers – which were very popular. I really enjoyed the job and (it) left me in good stead for my future work. At Bensons I started as a delivery runner, then in the darkroom and eventually on the seafront. This is fascinating Graham. I look forward to having a chat with you soon about the firm. 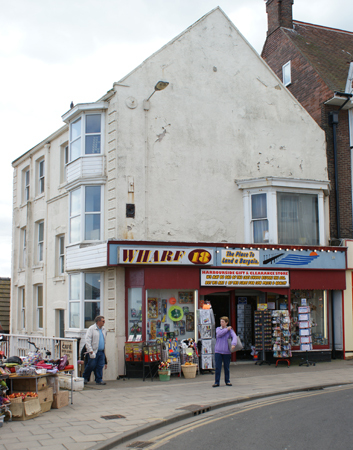 As Graham says they were rivals to Snaps, and operated in the 1950s and 1960s in Bridlington from premises on Bridge Street near the harbour. I also worked for Bensons in 1965. My favourite pitch was Kids Corner where most parents bought pictures of their children on the various rides. I also worked in the evenings doing pubs with a flash on my Retina 1a camera which was manufactured by Kodak. My friend Paul Eldred worked in the lab printing and another friend Frank McMahon also took photographs. Great times and great fun. Hello, I have an old photo of my mother when she was stationed there with the WAAF’s in WW11. It is a group shot of her and her unit in uniform, I have no idea where the base was. The photo would have been taken in the war years and is sadly rather worn, would you know of anyone who might have similar photos. Hi Roger. If it’s by Snaps, then the odds are strong that it was taken somewhere within the Bridlington area. There were a number of air bases in Yorkshire (including one at Driffield not far away where my Dad did his National Service). You can always send me over a scan and I’ll see if there is anything in the image which gives a clue. Simon. Hi Roger. Just found photo of my Mum’s group of WAAFs during WW2, taken by Brigham, Bridlington and googled name and found this website. Don’t know her base either. Did you find out any more about your mum and base? Hi Roger, There was quite a few RAF bases around Bridlington during and after the war the two notable being Carnaby and Lissett. My family come from a small village called Ulrome about 2 miles from Lissett aerodrome – my gran had lodgers from the RAF right up to the late 50’s – in fact my mother (aged 83) is still in contact with one or two from them. Snaps shut in the early 70’s, there is a facebook site called ‘Bridlington the good old days’ with some very knowledgable people – scan it and put it on there. Maybe this helps = let me know how you get on. I’d forgotten about Carnaby which is remiss as my mother (as a teenager) used to cycle out there during the war from her home on Cardigan Road to watch the bombers and aircrew. Apparently they housed Thor nuclear missiles there in the sixties, which is not something I knew when we drove past to visit my Grans on our holiday! She also had her portrait taken by Brighams as a child. Brighams old shop was up for sale last time we were in Brid, though the studio round the back was flattened years ago. Has anyone any old photos of the old garage and two houses on Scarborough road round about where the filling station is? My grandparents lived there and ran a market garden. No, Snaps didn’t keep the negatives beyond the end of the season. I’d be interested to see a scan of the card if you can send us one. I worked for Snaps during the summer season 1975 and 1976. The business was owned by a guy called Trevor. His wife ran the gift shop above the key ring viewer shop half way down the stairs. We processed the slides every lunchtime in order that the key rings could be sold at 3.30pm before the day trippers went home. We used Olympus half frame cameras and on a good day would snap about 5 films. At the height of the season there would be 6 of us. So thats about 2000 images a day. Thanks for this extra information Martyn. Did you take your photos in the immediate area by Snaps or further afield? Did you give the people a ticket or card, or was this a case of paying when you took the photo? We were called Smudgers, there were 6 pitches, from south side to The Donkey Bridge.Trevor paid the council for the exclusive rights for the season. Each pitch had a number, I liked the Harbour Wall so my snaps began with a 6 then a 4 figure number which helped us locate the image. The walkway from the top car park to harbour Road was the best pitch, the light was good, and it was easier to coral the customers, Sometimes we would team up with another smudger and put on the Ruprt bear costume, this too was profitable…but very hot in the fibreglass head.The cards were printed at the start of the season. At 3.30pm the punter brought in their cards (many would have at least 4) and we found the corresponding half frame slide, put it in a key ring viewer and let them choose. For each sale I got 50p at the height of summer it was very lucrative…unless it rained. Thanks Val, I will email you direct.